'Hell is other people.' 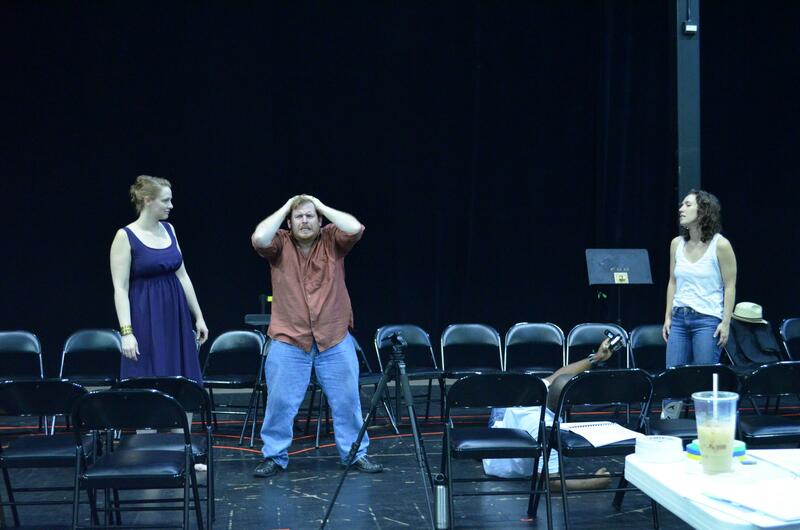 Singers with the Florida Grand Opera rehearse 'No Exit,' an opera based on Jean-Paul Sartre's existential masterpiece. So far, FGO’s offerings this season have been markedly different from the usual operatic crowd-pleasers (many of which revolve around a dying courtesan). The season opener was “Mourning Becomes Electra,” a contemporary opera that premiered in New York City in 1967. And this week, with help from a Knight Arts grant, Florida Grand Opera will present “No Exit,” based on the 1944 existentialist play by philosopher Jean-Paul Sartre. The opera will be staged at a South Beach nightclub, as part of the company’s “Unexpected Operas in Unexpected Places” program. Danis says it’s interesting to say "existential" and "Miami" in the same breath. But taking opera out of the opera house and into a bar? No biggie. “We have one of the youngest audiences in America. If you come on a Friday night, you know that people are going to the opera and then going out to the club. We have a really vibrant and hip audience,” she says. And since you just can’t beat technology for drawing in a younger crowd – on Saturday, March 1, “No Exit” will be streamed live online. Florida Grand Opera presents ‘No Exit’ at 10 p.m. Thursday, Feb. 27 through Saturday, March 1, at Arena Lounge, 653 Washington Ave., Miami Beach. Ever wanted to be on the operatic stage? Now’s your chance – and you don’t even have to carry a tune or know a Gotterdamerung thing about opera. Palm Beach Opera is expanding its talent pool of supernumeraries (non-singing extras) for its 2013 Season. The “supers,” as they’re called, perform as guards, maidservants, townsfolk, water sprites, matadors, etcetera, according to the needs of the production.